The search function is keyword-based, and collects results from the series, study and variable levels of each data collection. The following highlights important search functions of the ED Data Inventory, guiding first-time users in navigating the application. Basic search will perform a default boolean “And” search for multiple search terms. For example, searching on “child care” will yield results that contain both “child” and “care”. The last five search terms from your current session will be saved. Type a new search term or select a previously entered search term from the drop-down list located on the upper right-hand corner of the toolbar. Click the button or press the Enter key. The search results shows all series that match your query, as well as the number of studies within each series that contain the search term. By default, the list of studies and the number of variables within each study that match your query are hidden from view. Click the “Expand All” link. Click the icon or “study matches your query” link. Click the series title link. Click the study title link. Click the “BACK TO SEARCH RESULTS” button located above the “SERIES” and “STUDY” tabs. Click the “ADVANCED SEARCH” link located on the menu bar. From the main search page, type a new search term or select a previously entered search term from the drop-down list. And Narrows the search to include data containing all of the words entered. Or Broadens the search to include data containing any of the words entered. Exact Match Narrows the search to include data containing the exact search term. 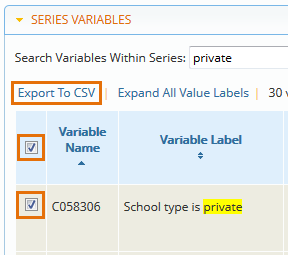 From the “SERIES” tab, click the “SERIES VARIABLE” section header. Type a search term in the text box. The search results shows all variables within the series that match your query. By default, the variable value labels are hidden from view. Word(s) that match your search term will be highlighted in yellow. Click the “Expand All Value Labels” link. 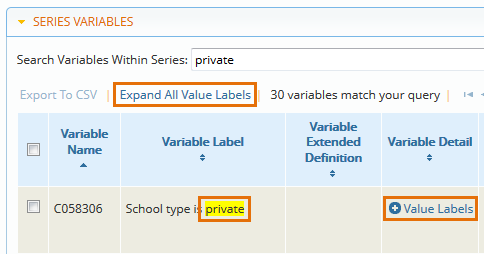 Click the icon or “Value Labels” link for a particular variable. Click the check box on the table header. Click the “Export to CSV” link. Click the check box to the left of the name of each variable you want to select. 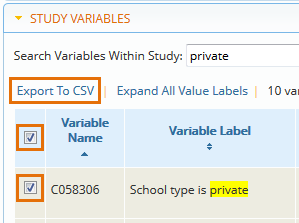 From the “STUDY” tab, click the “STUDY VARIABLE” section header. The search results shows all variables within the study that match your query. By default, the variable value labels are hidden from view. Word(s) that match your search term will be highlighted in yellow.